The Gurkul Dragon spent most of his life as a bodyguard dragon, looking after various kings and queens. 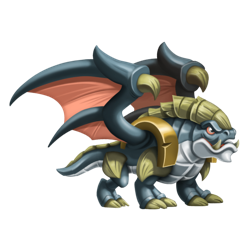 Now, he only protects himself, but he’s always on the lookout for danger and will extend himself to be a safeguard for any dragon that needs it. Gurkul is not Currently Breedable. Sorry. These dragons can all critical hit against Gurkul, but won't be critical hit by Gurkul.